In today’s episode, I am talking with Kim from Today’s Creative Life. Kim runs an effective tribe on Tailwind. So I asked her to come on the show and give my listeners some advice and help on how best to use tribes. What Is a Tailwind Tribe? A Tailwind tribe is a group of bloggers or people you connect with to share each other’s pins on a common topic. 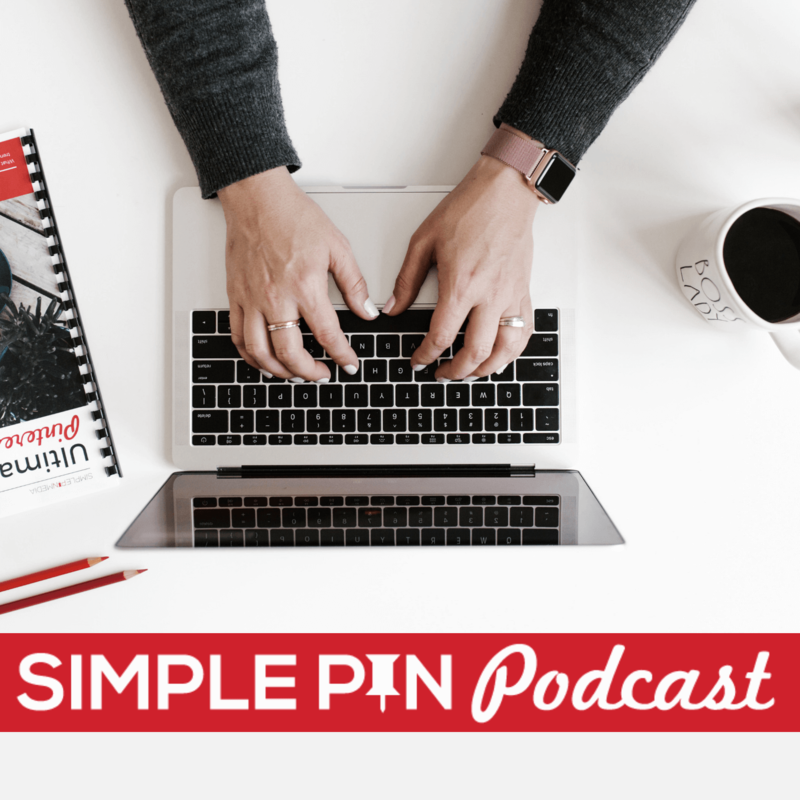 Not only is it a great way to keep track of people in your niche, but it gives you yet another way to assess the pin performance, since Tailwind tracks tribe shares and repins for you. How do you go about setting up a tribe? It couldn’t be easier. You can invite people individually, or you can share the link to a tribe, say in a Facebook group, and people can choose to join. Kim’s first tribe was called “Let’s Eat.” She shared the link to her tribe in a Facebook group and had a lot of people join. Those people started pinning to the board, and the result was that Kim was able to interact with a lot of people she didn’t know before. She has seen a higher level of reciprocity from tribes than she ever did in a Facebook share group. Tribes are an effective solution for my team to share content here at Simple Pin. With over 100 client accounts to manage, getting content from one client to share on another client’s page was never an easy process. We tried different types of groups, but now we use one main Simple Pin tribe, as well as several niche tribes. So should the average Pinterest user be excited about tribes? If so, why? Kim says, “Absolutely!” Tribes gives you an opportunity to get your content in front of people that you don’t know. So a new audience is seeing your content. You also have control over which pieces of content are being shared. How Do Tailwind Tribes Work? If someone invites you to join a tribe, you simply click on the link to join. As you begin to pin to the tribe, you’ll need to understand and follow the rules as set forth by the tribe owner. These rules typically outline the number of your own pins you can add relative to the number of pins of other members’ content that you share. As you choose other members’ content to share, those pins are automatically put into your Tailwind schedule. Using Tailwind tribes, you can easily fill your schedule with the types of content you want to share with your followers. Share 2 pins for each one you add of your own. If that seems too hard, then that tribe isn’t for you. The members have to stay active. It’s useful for absolutely nobody if a member isn’t sharing or contributing. The owner needs to stay active in maintaining the integrity of the pins being shared. If a pin isn’t Pinterest friendly, the tribe owner has the ability to delete the pin. Q– How do you find tribes to join? A– The first and best way to find suitable tribes to join is to ask in your niche Facebook groups, or ask other bloggers that you know. Tailwind tribes also has a search feature for finding relevant tribes. If you can’t find a tribe, then start one and ask 3-4 other people to join you! *If you are a member of my Simple Pin Facebook group, there is a list in the Files section of Tribes. Q– How often should you add the same post to 1 tribe? A– On a large board, about once a month should be fine, if the owner hasn’t set rules for the timing of pins. Waiting 2-3 months is even better for smaller boards. And don’t just keep adding the same pin every single month; you have more than 1 pin, so share different ones. Q– How long should you stay in a tribe to see if it’s a good fit for you? A– Watch for your pins to be shared from the tribe. If you contribute pins, but there are no repins, then the members are treating the tribe more like a group board. Pinning to the tribe doesn’t put your pins in front of anybody; the members have to share them in order to get them out there. Sign up for a free trial of Tailwind here. If you want more information on Tailwind Tribes and best practices as of 2019, give podcast episode 135 a listen. Alisa Meredith from Tailwind gives us TONS of actionable strategies and tips for using Tribes to your advantage. Have you experienced success using Tailwind tribes to gain traction on Pinterest? Share in the comments below. Thanks for the great podcast! What was the name of the Google Chrome extension you both mentioned? It sounded like Sophie’s app? I need to listen again to remember. 🙂 We recorded it a few weeks ago. What were we referring to and that may help me refresh my memory. It’s at the very beginning at 2:53. It is a productivity app? Kill News Feed — that is what I use for Facebook. That’s a Google Chrome Extension. It has totally saved my productivity. Hopefully that’s it! Great podcast! I love Tribes even just for finding content. And your conversation was so helpful to remember that it’s different from the regular Pinterest feed. Tribes need us to be active in there. I have a question about something Kim said toward the end. After talking about traffic from Tribes and actively pinning. She said “you can also click the little blue check mark next to their…” and I couldn’t understand the rest! Sounded like maybe “movement” but I don’t know what that means. Would love to get clear on this tip. Thanks! I believe she was referring to their activity. So you can see how many they have shared and added to the tribe. You can also click the check mark and it will only show you their content. Sorry about the sound! I’ll have to go back and fix that. Most important thing which I liked regarding using of Tailwind Tribes – helps to get one of your pins to go viral and your pin shared as much as possible. Eventually, thanks for exploring in deep and surely going to very helpful for bloggers as well as online marketers. portion of the new year. You havе Ьeen conducting a golod job. Tribes don’t really work for small niches. Tailwind did a conference with me last year for their information. I was hopeful but never heard back from them. I will write them now that I heard your podcast and see if they have suggestions. I am a ballet teacher, make tulle skirts on Etsy and also digital prints on Etsy. Any suggestions? Thank you Kate! Yes! I love that part about it. if anyone would like to join! This is my favorite podcast so far! Kim was so knowledgeable as well as entertaining. I listen when I walk in the morning and was laughing out loud at the beginning! Thank you for all you do, Kate! It’s great to be able to multitask- get my exercise while learning more about improving my business! is rattling interesting and holds lotts of gkod info. Reаlply cleazr web site, thank you for this ⲣost. I began using Tailwind the last day of May and I admit that I have probably not taken full advantage of the program. I purchased the Unlimited monthly plan and have had good results in some areas like food and recipes and a ton of repins in fitness that has not translated to site visitors. I have had an explosion recently from 200 or so site visitors to over 2000 visitors a day all from one pin. I would assume that is from repins but that is a ton of traffic from me and so far the traffic is continuing to come in every day from the 1 pin.